Honorable speakers, from left to right: Ms. Yam Veansa, Chief of Administration of Kien Svay district, Mr. Tri Bunheng, Director of Takmoa Provincial Investment and Development office, Ms. Thida Khus, Executive Director of SILAKA. 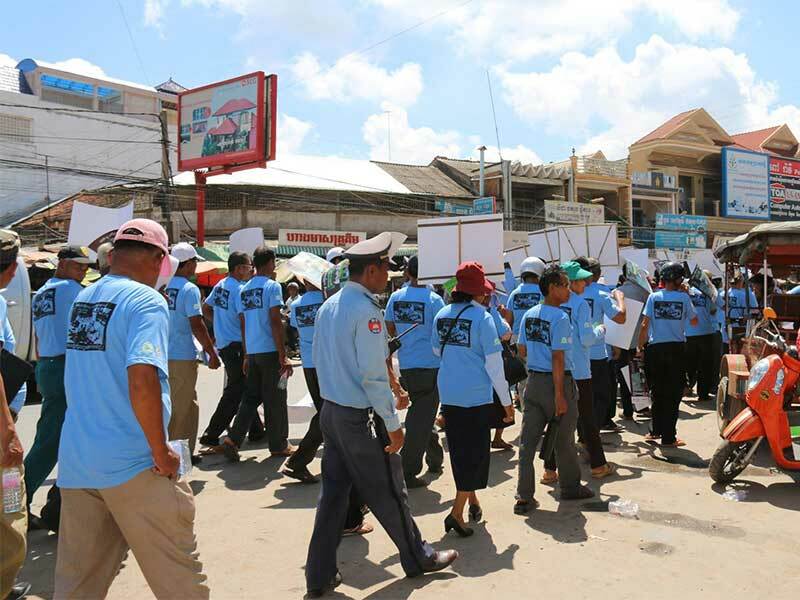 Kandal (May 31, 2016)-Over two hundred participants joined the public campaign to promote awareness of public procurement at sub-national level which conducted at two different dates and places in Kandal province on May 30, 2016 at Preah Pot Andaet pagoda, Takmoa Town, and May 31, 2016 at Kein Svay district hall. The public campaign is originally intended to promote awareness of public procurement and to engage local citizens join and monitor when has bidding meetings, to increase attentions from local citizens on public procurement in order to promote good governance and build trust on local authorities works. Khmer classical drum dancers (Chai Yam) accompany the campaign and sing educational songs of public procurement near Korki market. Ms. Thida Khus, Executive Director of SILAKA, said the public campaign is the one of other activities in the project named “Strengthening Procurement System at sub-nation Level (SPSL)”, this project has been implemented for four years, and this is the fourth-year that SILAKA is spreading out the implementation of project in Kandal province. “Today, I would like to thank all for your participation in the public campaign, in order to raise awareness and make betterment of public procurement in Sakat(district), especially Sakat Preak Ho, Sakat Takmoa, and two communes in Kien Svay district.” Said Mr. Chea Sivatha, deputy governor Takmao town. In additions, Mr. Sivatha mentioned the eight tools of Good Governance such as Accountability Transparency, Response, Equity and Inclusiveness, Effectiveness and Efficiency, Rule of Law, Participatory and Consensus oriented. And now we are joining to implement one of the eights element of good governance is Participatory. 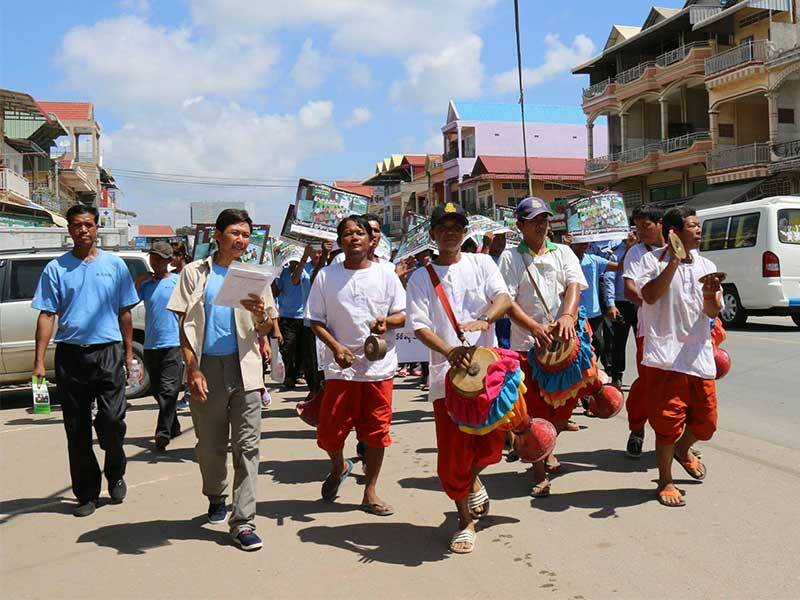 Local citizens, police, officials from villages in Kein Svay and Korki district march the campaign near Korki market. 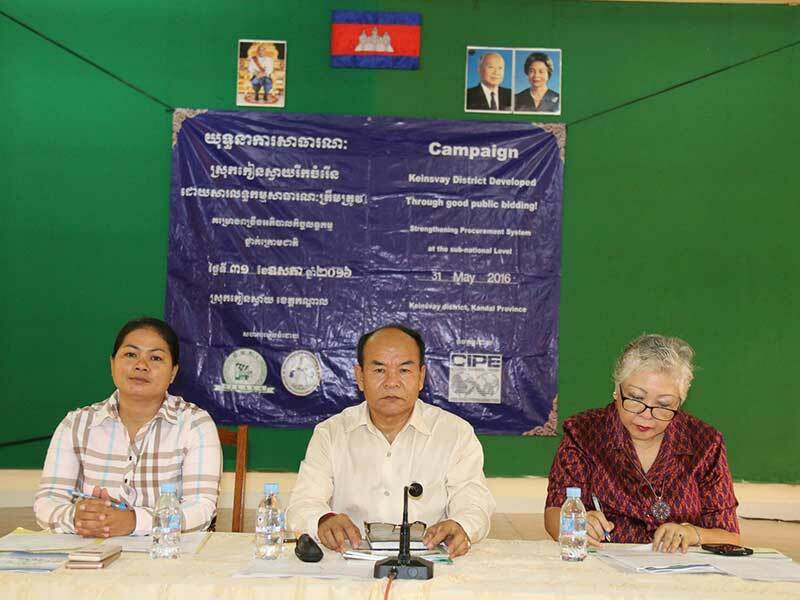 Ms. Yam Veansa, Chief of Administration of Kien Svay district, said “this is the first time in Kien Svay hall under the cooperation with SILAKA for conducting public campaign to promote awareness of public procurement”. She added “this project purposes is to make betterment in bidding process through transparency, accountability, acceptable price and good quality”. “Good Governance is the core of government’s rectangular strategy, for implementing national plan and developing decentralization policy in the purposes developing local”, said Mr. Tri Bunheng, Director of The Provincial Investment and Development office. Notice that Kandal province is the second province after the first province, Kompong Thom in Cambodia which implementing project SPSL in promoting public procurement at sub-national level, starting with Preak Ho commune, Takmoa Town, Dey Et commune and Korki commune.